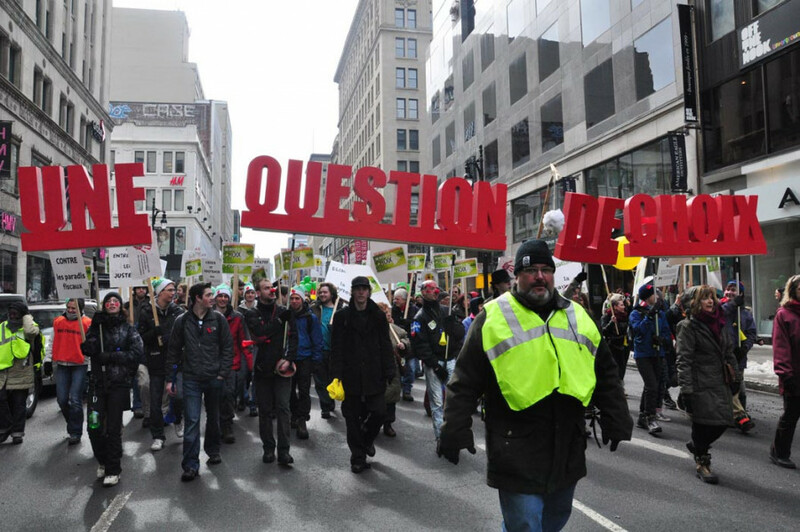 Over 50,000 students, union members and activists from all over Quebec marched through downtown Montreal on Saturday afternoon to protest proposed austerity measures in the upcoming Quebec budget. Police arrested 10 people before the march began. The six men and four women—aged 20 to 25—were detained and scheduled to appear in court on Monday to face charges of conspiracy. According to police officials, the protesters possessed weapons and intended to use them. Several police officers on horseback entered the crowd on Rue de la Cathédrale, where people were preparing to march. The police then separated a group of people—dressed in black with their faces covered—from the crowd. A few people in the crowd tossed snowballs at the police as they were leaving. Aside from that incident, the protest went smoothly. 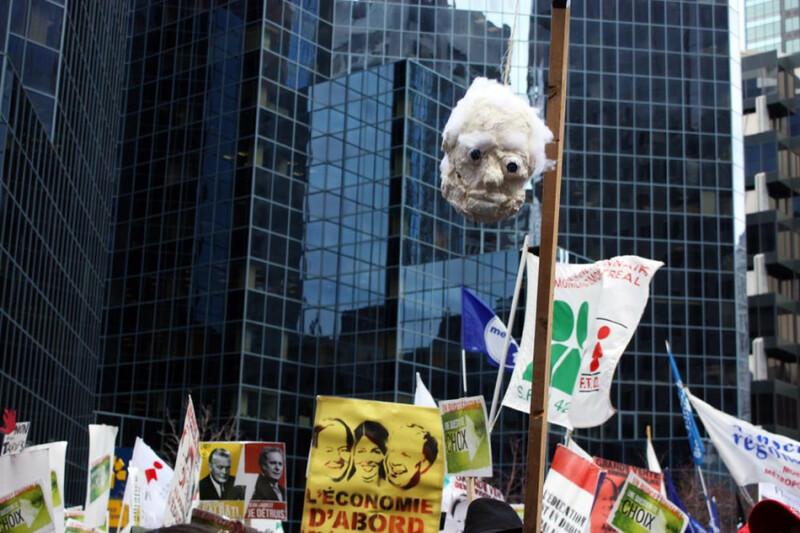 The march, organized by La Coalition opposée à la tarification et la privatization des services publics and Alliance Sociale, began at Place du Canada and was thick with people for over six city blocks. Protesters crowded René-Levesque Blvd. and Ste Catherine St. before making their way to the rally on McGill College Ave. 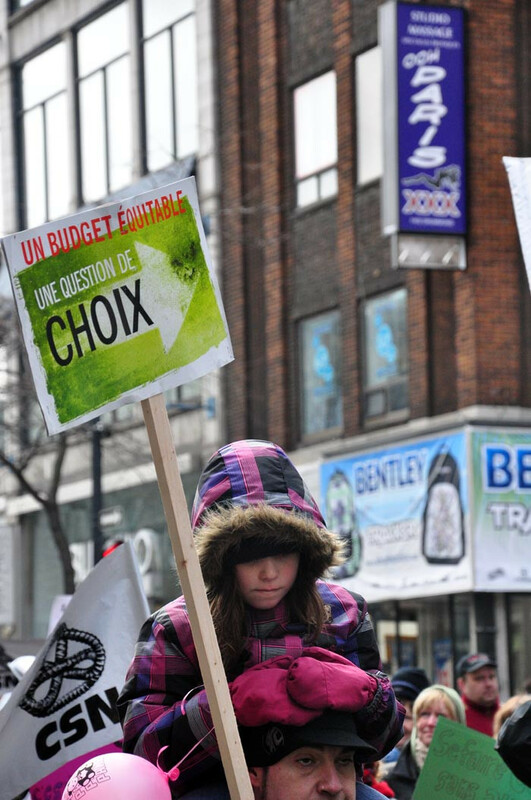 Tuition hikes, the $200 “health tax,” increased user fees and cuts to public services were some of the grievances voiced by protesters. Those measures are expected to appear in the 2011-2012 Quebec budget, which the Charest government is tabling this week. The government has proposed measures that have angered many in an effort to balance the budget by 2013. 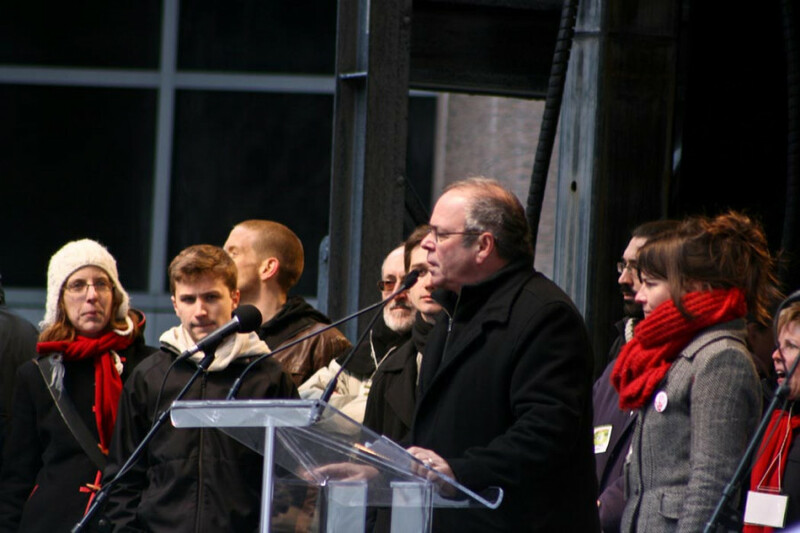 “We want to send out a clear message that hikes in tuition fees are not acceptable [and will not be accepted] by the Quebec society as a whole,” said Louis-Philippe Savoie, the president of the Fédération étudiante universitaire du Québec. 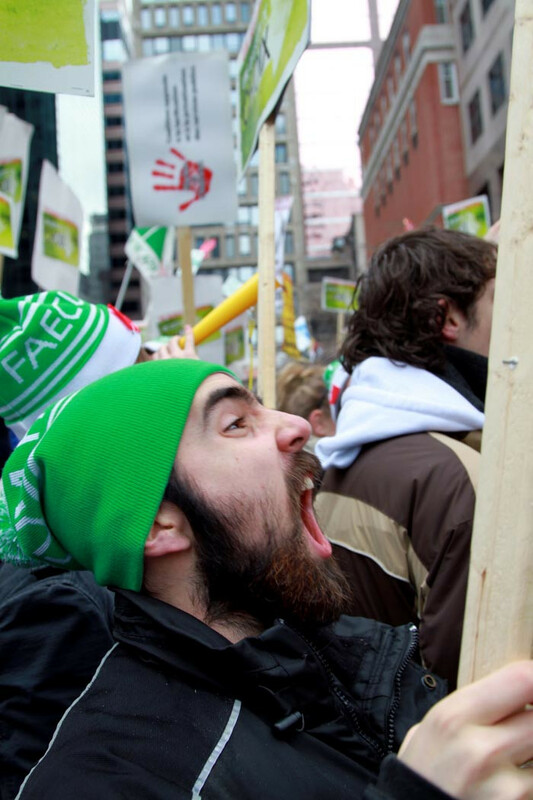 Students from universities and CEGEPs around Quebec were out in full force Saturday. Many had painted red handprints on their faces to signify their anger at the proposed hikes. 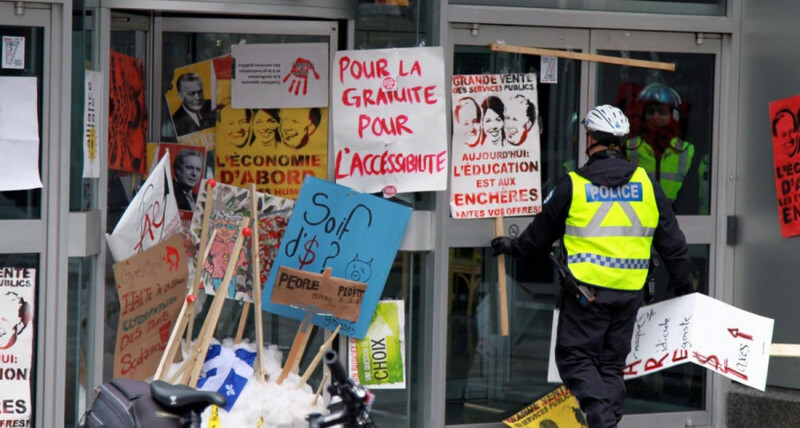 People held signs saying “L’éducation, c’est pour tout le monde” and “Charest eats kittens.” Buildings and monuments around Place du Canada were peppered with “Charest dégage” graffiti. The day before the protest, Fleming, 27, found out that she was accepted to Concordia for the master’s program in media studies. According Robert Sonin of Free Education Montreal, most master’s degree in Quebec costs $3,150 annually in tuition. Quebec has the lowest tuition fees in the country. It is expected that the Charest government will try to raise tuition to the national average over the next three years, which would amount to a 140-per-cent increase. This would eventually mean an additional $4,500 for students like Fleming. Those figures do not include additional ancillary fees, which vary depending on the department. Fleming says she already has $20,000 in debt from her undergraduate degree from the University of Alberta. According to her, unless she receives enough funding from grants or the university, she will have to choose between going to school and adding to her debts or trying to work full-time and pay them off. Fleming has been in Quebec for four years. She works two part-time jobs at the Atwater Library as a part of its Digital Literacy Project, a program that helps community groups become computer literate and use technology to create their own media. Her project for her master’s degree is also focused on local Montreal neighbourhoods,specifically with the documentation of the destruction of community monuments in working class spaces in Griffintown during the 1960s. “I moved to Quebec […] feeling that it was the one place I could go to receive a high quality education and still be able to afford [it],” said Fleming. Many students on Saturday expressed concerns that they and their colleagues will have to make the choice between going to school or avoiding large amounts of debt. It is a decision that Fleming is not looking forward to making. “I can’t even fathom that right now. It makes me really depressed,” she said, trying to laugh as tears welled up in her eyes.